Colorful and easy Easter crafts for Rockets of Awesome to appear on their Instagram feed and how-to’s for their Stories. Easy pumpkin decorating ideas for Parents Magazine that keep the mess to a minimum by avoiding carving. Each pumpkin only needs a few readily available crafts supplies and simple techniques so these crafts are kid friendly. For a nature loving couple I created southwest themed decor for a casual shower brunch at a restaurant. Decorations included foldable paper cacti; hand painted succulent favors; hand lettered and illustrated printed materials; sourced wooden animals; and a painted table runner. Projects created for the blog Oh Happy Day. Custom decorations for a unicorn-rainbow extravaganza of a wedding, including larger than life glittering unicorns, a rainbow honeycomb arch, custom designed pillows, and floor to ceiling tinsel. A styling and DIY project for Apartment Therapy, in collaboration with Dunkin' Donuts. A test shoot featuring winter craft projects. Halloween costumes for Parents magazine designed to be a little bit silly. Projects created for HGTV magazine, in collaboration with Lifestyle Editor Jodi Kahn. Paper craft projects created to showcase tools from the Martha Stewart Craft line. A group of easy-to-make planters to spookify houseplants on Halloween, because plants are the new pumpkins. Created for Apartment Therapy. Crafted gifts kids can make for FamilyFun magazine. Craft projects for Halloween, Thanksgiving, and Christmas for Martha Stewart Craft Tools. 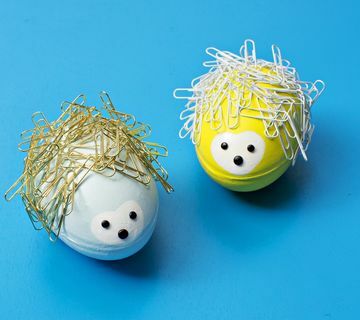 Easy ways to jazz up basic backpacks along with DIY toggles for FamilyFun magazine. Paper flowers and fabric set for a test shoot with Ana Gambuto. Projects for kids to make in the wintertime for Scholastic Parent & Child magazine. Set design and construction for a test shoot. Fashion by Sarah Conroy, photography by Ana Gambuto, and hair/makeup by Brit Cochran. Hand-sewn costumes for an American Baby cover. Easy DIY Halloween projects for Elle Decor online. A baby shower with a seaside theme for a dear friend. Book projects I've illustrated and designed for family. A story my father in law told his kids. My husband and I reworked the story and created the book as a gift for our niece so she could hear her granddad read it to her. Gifts kids can make for their teachers, created for FamilyFun magazine. Party favors and other decorations for a surprise 40th birthday. I made paper flowers using the Financial Times, the guest of honor’s favorite daily read, and illustrated his heroes for gallery with a suggestion jar. Projects created for the January/February 2019 issue of HGTV magazine, whose cover showcased a shelf full of home decor DIY projects.